No coincidence, since the proprietor who lives out his passion as a personal trainer under its roof, Brandon Montella, has found a way, in his own unique way. From a turbulent childhood in North Anson, Maine, to four years of meritorious service in the United States Marine Corps, to the mixed emotions of staying ahead in the professional rat race, to intense personal tragedy, Montella, 36, has endured what most would consider a lifetime’s worth of challenges. Yet he perseveres, finding strength and clarity in a life devoted to helping others. And he stays sharp, counter-intuitive as it may seem to the uninitiated, by letting other people punch him in the face. Montella was born in Massachusetts but spent much of his childhood in the Western foothills of Maine, where he graduated from Carrabec High School. He describes those formative years as “a tough time, a little bit of a struggle,” and says fighting was both a means of both self-defense and a way of compensating for that lack of self-esteem. He spent four years in the service before receiving an honorable discharge. Along the way he met his wife, Tonya, and settled into the comfortable habit of seeking significance through work. Fatefully, and admittedly on a lark, he accepted a military buddy’s challenge to enter a Toughman contest. It was the amateur, brawling, distant cousin of boxing that Eric “Butterbean” Esch made famous. “I was a 240-pound meathead. Three one-minute rounds; that seemed like it was right up my alley,” Montella said. In the process, Montella discovered that getting back in shape, setting goals and chasing intangible successes that were larger than wins and losses suited him, too. Well, it wasn’t quite that easy. He had to sell Tonya, whom he describes as “the major breadwinner in the house,” on the merits of such a change. She already had politely proclaimed Maine a great vacation spot but not a place she cared to settle down, for professional reasons. In 2008, work took Tonya to Boston. Montella started his gym in a 10-feet-by-10-feet basement of a townhouse. He took up amateur boxing, in part, to set an example for his clients. He won 14 of his 21 amateur fights, including a novice heavyweight championship in Golden Gloves. Montella’s trainees have watched him conquer adversity in the prize ring and fight through tragedy in his personal life. Tonya and Brandon’s first child was stillborn on Christmas 2015. Boxing, and the wilderness in the shadow of Sugarloaf Mountain that holds so many contradictory memories for Montella, are part of his healing process. “I’m here in Maine now getting ready, diving off 40-foot cliffs, doing hill sprints up 100-foot sand dunes, training like a savage,” Montella said. “We used to go up there to drink. All the crazy stuff I did as a kid, now I use it to make myself the best I can be. The opening bell on September 10 is set for 7 p.m. 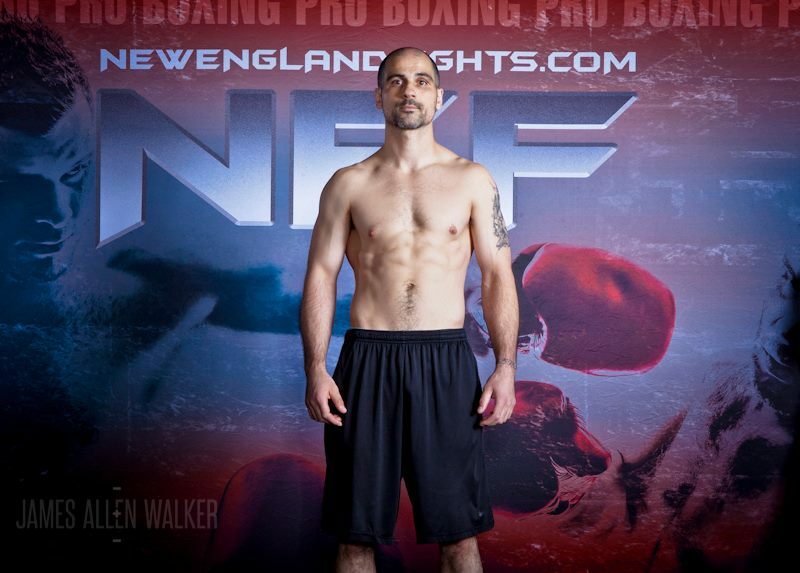 The current docket for “NEF 25: Heroes and Villains” includes three professional boxing matches, five pro mixed martial arts bouts and six amateur MMA scraps. Tickets start at $25 and are available at www.TheColisee.com or by calling the Colisee box office at 207.783.2009, extension 525.